The three-row crossover segment is littered with great models and the 2017 Ford Edge in Peoria is one of the top prospects. Designed to seat up to five passengers, this celebrated Ford model is known for offering ample interior space, a smooth ride and a wide range of luxury features. To top things off, the vehicle is also available with multiple fuel-efficient engines that deliver max performance. Please read our 2017 Ford Edge review below to learn further details about the peppy crossover. 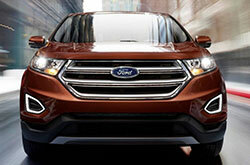 Buyers interested in the new Edge will be pleased by the vehicle's trim options. SE, SEL, Titanium and Sport make up the roster, and offer a variety of excellent technologies. 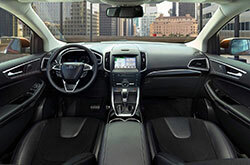 Starting off, the 2017 Ford Edge in Peoria is equipped with LED taillights, remote locking and unlocking, a six-speaker sound system, Bluetooth connectivity, Ford SYNC, voice recognition, cruise control, rear privacy glass and automatic headlights. When you move up the trim line, you'll gain other notable technologies, including HD radio, a hands-free liftgate, a panoramic sunroof, automatic wipers, ambient interior lighting, heated front seats and dual-zone automatic climate control. All models aside from the Sport get a standard turbo 2.0L four-cylinder, delivering 245 horsepower and 275 lb.-ft. of torque. 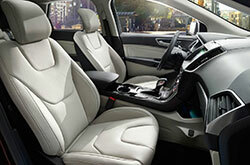 Available on front-wheel drive and all-wheel drive models, the engine is mated to a six-speed automatic transmission. On the SEL and Titanium, buyers can opt for a non-turbo 3.5L V6, offering 280 horsepower and 250 lb.-ft. of torque. 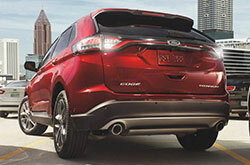 Both the 3.5L V6 and four-cylinder can tow up to 3,500 pounds when properly equipped. The Sport is fitted with a turbo 2.7L V6, generating 315 horsepower and 350 lb.-ft. of torque. When properly equipped, it supports a 2,000-pound tow rating. This has been noted in several 2017 Ford Edge reviews. Curve Control, antilock brakes, traction control, stability control, airbags, a rearview camera and 911 Assist are all standard safety components included on the Ford Edge. To enhance safety, buyers can also choose to add on blind-spot monitoring, rear cross-traffic alert, lane departure warning, a forward collision mitigation system and inflatable rear seat belts. Don't just consider the 2017 Kia Sorento, Nissan Murano, Jeep Grand Cherokee and the Toyota 4Runner when on the hunt for new cars near Phoenix; also be sure to take a good hard look at the radiant 2017 Ford Edge. You could find that with its variety of user-friendly features and exciting personality, it suits the demands of your individual needs. See if the 2017 Ford Edge is a good choice for your express needs, then browse our site to find new information on exclusive offers. As your local Ford vehicle retailer, we're the location to find financial incentives on the Ford Edge, as well as other new and quality used vehicles. We hope our 2017 Ford Edge review provides assistance when you're ready to make your final buying decision. 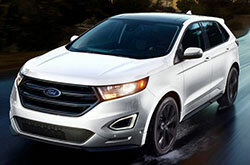 Schedule an appointment to test drive the Ford Edge in Peoria, AZ, and examine the gorgeous model for yourself. 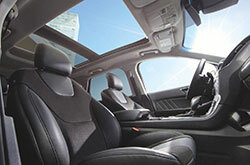 If you're interested to see it prior to your visit, view its interior and see how it's equipped in the embedded video.